Enjoy this two bedroom and two bathroom Oceanside condo in South Mission Beach. Just a few buildings from the ocean and a block and a half from the bay, you get the best of both worlds here. 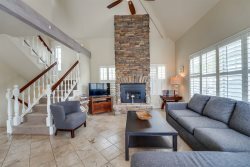 The modern living room is furnished with a flat screen, fireplace, cable TV, DVD, coffee table and very comfortable seating including chairs and a sleeper sofa. The living room is open to the kitchen, which flows with natural light. The kitchen has plenty of cabinet space, a wood dining table for eight, dishwasher, microwave, stove and all the kitchen appliances that you will need. On the first floor, you will also find the guest bedroom with en-suite bathroom with a shower/tub, queen bed and wall to wall mirrored closet. The second floor is home to a spacious master bedroom with an en-suite bathroom with a shower/tub, queen bed, two mirrored closets and a five drawer dresser. Connected to the master bedroom, there are three spacious, private balconies. One balcony houses a large gas grill with a dining table and lends ample room for your family and friends to catch a captivating sunset or barbecue your favorite meal. 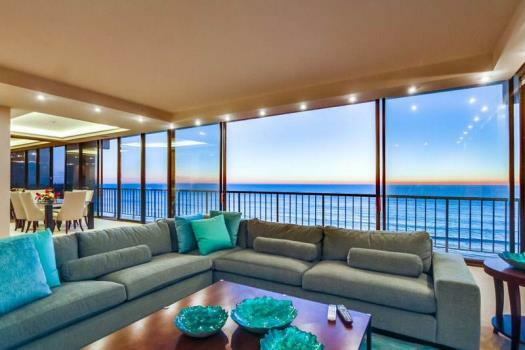 This gorgeous rental has partial ocean views and a full size washer and dryer. Without exception, everyone we dealt with was kind and professional. Let me commend the LOVELY young woman who checked us in on Sat August 5th. We arrived several hours early and our accommodation was not quite ready; she lent us beach chairs and umbrellas and helped us start our vacation in the best possible way. All the members of the team at Penny Realty were great to work with. Courteous, helpful and professional all the way! The location was great and we enjoyed our stay very much. The only thing was that the information provided on your website said there was a King Bed and a Queen Bed. There are actually two Queen Beds at the property.